by Chris Woodford. Last updated: January 4, 2019. You've seen those amazing, Olympic cyclists leaning forward, crouching, head-down into a snug, aerodynamic position to shave every possible second off their time? The only real problem is if they hit something and crash. Riding with your head so far forward means it's much more likely to bear the brunt of the impact when you smash into the road. Head injuries are really bad news. According to the US Consumer Product Safety Commission: "About 900 people, including more than 200 children, are killed annually in bicycle-related incidents, and about 60 percent of these deaths involve a head injury." Thank goodness, then, for bicycle helmets. Like your favorite candy, they're hard on the outside and squashy in the middle—and that two-layer design helps them absorb impacts and save your life. Let's take a closer look at how they work! Photo: When cyclists lean forward to create a more aerodynamic shape, it automatically puts their head at greater risk of injury in a crash. That's why wearing a helmet is important. Note how this rider's helmet helps to create a much more aerodynamic shape for his body by smoothing out the transition between his head and the curve of his back. How does a bicycle helmet work? Photo: How a helmet saves your life: When you bump your head, the hard outer shell (black) spreads the impact over a wide area. The whole of the soft inner liner (orange) then absorbs the energy evenly so (hopefully) there's minimal damage to your head. Without the helmet, the entire impact would be concentrated on a tiny part of your head, very likely fracturing your skull and quite possibly damaging your brain too. At first sight, a cycle helmet looks much like any other hat, but look more closely and you'll see a lot more thought—and science—has gone into the design. A typical helmet has two main parts: a hard outer shell and a soft inner liner. The hard shell is designed to spread the force of an impact over a broader area so your skull is less likely to fracture, while the soft liner is meant to squeeze inward and absorb the impact energy, so less of it is transmitted to your head. Bicycle helmets are a good example of how the right material can make all the difference to how well something does its job. Shells are typically made of composite materials like fiberglass or lightweight carbon fiber, or very hard plastics such as polycarbonate or ABS. Liners are usually about 20cm (0.8 inches) thick and made of two layers of foam: a soft, bouncy layer that absorbs small bashes and bumps and a stiff layer that permanently deforms to absorb very hard impacts. Some helmets are now incorporating energy-absorbing plastics like D3O® that are soft in normal use but harden instantly the moment you hit them, but most still use cheaper and simpler materials like expanded polystyrene (EPS) or expanded polypropylene (EPP). In some ways, the human body is like a smokestack: lots of the heat our bodies lose disappears straight up through our heads. We wear woolly hats on cold days to keep the heat trapped inside. But by the same token, wearing any kind of close-fitting hat on a hot day can really make you perspire. That's why bicycle helmets generally contain lots of ventilation holes. The trouble with punching holes in things is that it makes them structurally much weaker, so the vent holes in cycle helmets work directly against the job they're designed to do (protecting your head). Not only that, they also disrupt the airflow over the helmet, causing turbulence that slows you down. Designing a decent bicycle helmet involves a careful balance between protecting your head, keeping you cool, and making you aerodynamic enough to go reasonably fast. 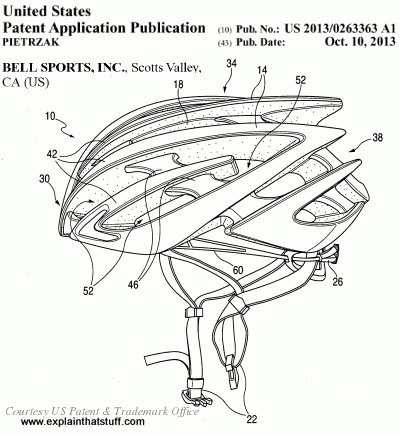 Artwork: From US Patent 20130263363 A1: Protective bicycle helmet with internal ventilation system by Chris T. Pietrzak, assigned to Bell Sports, Inc., granted October 10, 2013. Courtesy of US Patent and Trademark Office. Here's a recent helmet from Bell Sports of California, with a novel design for maximizing airflow and ventilation around the rider's head, while retaining strength and reasonable streamlining. I've kept Bell's numbers on the artwork, but provided my own simplified descriptions of them. The front of the helmet (the rider's nose) is on the left. 10. The overall helmet design. 14. Hard outer shell made of ABS plastic, Kevlar®, polycarbonate, fiberglass, or similar. 18. Inner foam layer typically made of EPS or EPP. 30. Protection for the front of the head. 34. Protection for the crown of the head. 38. Protection for the back of the head (and the brain's occipital lobe). 42. Structural, longitudinally extending ribs. 46. Laterally protecting webs connecting the ribs together. What's the best bicycle helmet to buy? Photo: The best helmet for you depends partly on how you ride. 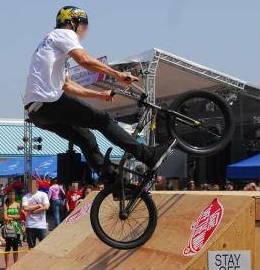 Some BMX riders prefer ones like this, which are more like climbing helmets, and don't have air vents. You're guaranteed to crash if you do this kind of riding so a helmet is really, really important. Photo by Brock A. Taylor courtesy of US Navy. Does it fit snugly and stay properly in position on your head? Is it light and comfortable? Does it have enough ventilation holes so it stays cool? Do you like the look of it and will you actually wear it? Does it meet the latest consumer standards? It may sound strange, but the last one of these is probably less important than the others: the best helmet in the world is no good at all if it's too hot or uncomfortable for you to keep it on your head. But assuming you find a helmet that fits, looks good, and you're definitely going to wear, make sure it meets the toughest test: that's the US Consumer Product Safety Commission (CPSC) bicycle helmet standard. There are other, lesser standards you don't need to bother with. 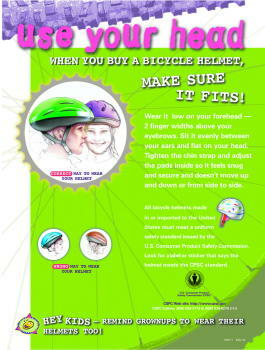 If a helmet doesn't meet the CPSC standard, don't buy it. Photo: A bicycle helmet must fit properly and be worn the right way (low on your forehead) if it's going to be of any use at all. Poster courtesy of U.S. Consumer Product Safety Commission published on Flickr under a Creative Commons Licence. You can buy a new helmet anytime you get sick of your old one, but you must always buy a new helmet if you have a crash. If you crack your helmet or compress the foam, it's not going to work properly the next time—so get rid of it! For the same reason, never buy secondhand helmets in thrift stores, from friends, or on places like Web auction sites; you don't know what they've been through already and whether they're still going to give you the protection you need. People used to think bicycle helmets were uncool, but that's all changed now. You won't find any professional cyclist racing on the road or a track without a helmet clamped firmly to their head. And helmets are so much better than they used to be. Have you noticed how cool Olympic cyclists look in those teardrop-shaped chrono hats? Virtually all modern cycle helmet are amazingly swish and can make even the slowest of riders cut a dash. One word of warning, though. Everyone wants to look good, but remember that a cycle helmet is primarily about protection. Fussy, elaborate extras are usually just marketing gimmicks—so don't waste your money. There is an argument that helmets don't make as much overall difference to how many people are killed or injured in bicycle accidents as you might expect. People who study the psychology of risk point out that if we make ourselves feel safer (with helmets on bicycles or seat belts and airbags in cars) we ride or drive more dangerously and put ourselves at greater risk of an accident—so the two factors cancel out leaving us no better off. Could helmets put people off cycling? There's another problem too. Society has become much more safety-obsessed and risk-averse, and that's often neither a good thing nor a rational one. Some people will look at cyclists hurtling by in helmets and high-visibility jackets and conclude that it's far safer to sit at home or take the bus than to venture out on the road. In other words, cycle helmets could deter people from cycling altogether—making them miss out on the health benefits of the excellent exercise it provides. If we consider society as a whole, inactivity and lack of exercise could actually pose a bigger risk to health than injuries and fatalities caused by cycling. So whether helmets save lives overall is actually a much more subtle and complicated issue than it first appears—and it's especially contentious in countries such as Australia where helmet wearing is compulsory. This argument has been forcefully made by Australian researcher Bill Curnow in a variety of papers, including Bicycle Helmets: A Scientific Evaluation [PDF]. Chris Rissel, Professor of Public Health at the University of Sydney, argues that "... the benefits of cycling outweigh the risks, with helmet legislation actually costing society more from lost health gains than saved from injury prevention." Others argue that the risk of putting people off cycling is less relevant than it might appear. In a recent review of 21 separate studies, Alena Høye, from the Institute of Transport Economics in Norway, has suggested: "People who may be deterred from cycling are among those with the highest injury risk and the smallest health effects from cycling." 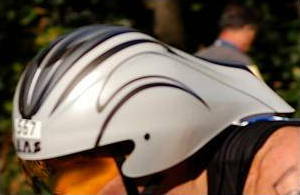 Photo: An aerodynamic chrono helmet being worn by a triathlon rider. The teardrop shape reduces air resistance around the rider's head, which means it has a smoother surface and fewer ventilation openings than on a typical road cycling helmet. Photo by Suzanne Day courtesy of US Air Force. A recent two-year study of injuries treated in one hospital by Dinh et al found that "A lower proportion of people wearing helmets had significant head injury... or facial injury... compared with non-helmet users... [and] helmet use was associated with a 70% decrease in the odds of significant head injury." Another study, by Canadian researchers Costa et al, concluded that not wearing a helmet doubles the cost of hospital treatment for cyclists who suffer traumatic brain injuries. But that doesn't mean helmets are guaranteed to help in every situation. A recent study of 3854 injured cyclists (by Rivara, Thompson, and Thompson) concluded that "Prevention of serious bicycle injuries cannot be accomplished through helmet use alone, and may require separation of cyclists from motor vehicles." That's perhaps not surprising when you consider the relative mass and speed of a cyclist and an automobile—and imagine what happens when they collide. Whether a helmet helps you also depends on who you are. One 2015 German study ("Prevention of Bicycle Accidents" by Zwipp et al) argued that "Elderly bicyclists... are a minority... but represent a majority... of all fatalities. They profit most by wearing a helmet." Back in Australia, where the debate continues to rage over compulsory cycle helmets, a 2016 statistical review of some 40 separate studies by Jake Olivier and Prudence Creighton concluded that "Bicycle helmet use was associated with reduced odds of head injury, serious head injury, facial injury and fatal head injury"—a 70 percent reduction in serious head injury and a 65 percent reduction in fatal head injury. It's difficult to argue that bicycle helmets benefit everyone, equally, in all situations, or that wearing a helmet should be a legal requirement. Ultimately, the choice is yours. If you're an ordinary, careful rider and you just happen to have an accident that you survive, a cycle helmet could reduce your risk of a serious head injury and save your life. That's why many cyclists conclude that wearing a helmet is a no-brainer, while not wearing one could leave you with no brain. But while scientists and doctors argue over whether helmets are a good or a bad thing overall, and whether their use should be voluntary or compulsory, there's absolutely no way of knowing whether a helmet will make any difference in any one particular accident; that's the nature of risk. And risk is an unavoidable part of our life. Bicycle Helmet Safety Institute: A superb resource covering literally everything you could ever want to know about helmets. Materials for Bicycle Helmets: For the more scientifically minded, this interesting research paper explains how different helmet foams compare in energy-absorbing performance. Cyclist safety: Arguments for cycle helmets from Brake, the UK road safety charity. Bicycle Safety Publications: A range of helpful safety advice from the U.S. Consumer Product Safety Commission. Cycling UK angered by Highway Code's 'victim blaming' helmet advice by Amy Walker. The Guardian, January 4, 2019. Campaigners criticize official UK advice recommending cyclists should wear helmets. 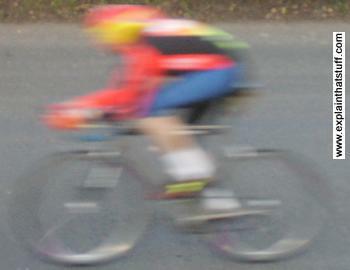 Bicycle helmets reduce risk of serious head injury by nearly 70%, study finds by Paul Farrell. The Guardian, September 22, 2016. New data suggests helmet use dramatically reduces the risk of head injury. Mandatory bike helmet laws do more harm than good, Senate hears by Oliver Milman. The Guardian, August 12, 2015. Australian campaigners argue that helmets discourage cycling, causing overall harm to society. Bicycle Helmets as Fashion Statements by Simone S. Oliver. The New York Times, July 10, 2013. Why humdrum helmets have become stylish fashion accessories. To Encourage Biking, Cities Lose the Helmets by Elisbaeth Rosenthal. The New York Times, September 29, 2012. Helmets may save lives, but they discourage people from cycling. The secret ingredient for a safer bike helmet: paper by Anna Lacey, BBC News, 12 January 2014. Inventor Anirudha Surabhi believes corrugated paper structures could slow down an impact and reduce injuries more effectively than conventional foam. US Patent 5,351,341: Multiple density helmet body compositions to strengthen helmet by Lester V. Broersma, Bell Sports, Inc. October 4, 1994. Describes a typical bicycle helmet and includes detailed design drawings. US Patent 5,351,341: Aerodynamically streamlined bicycle racing helmet by James J. Gentes et al, Gyro Sports Design, Inc. February 27, 1990. Describes an aerodynamic helmet and a means for keeping it steady on the rider's head. US Patent 6,401,261: Sizing and stabilizing apparatus for bicycle helmets by Michel D. Arney et al, Bell Sports, Inc. Jun 11, 2002. Describes a more elaborate way of keeping a helmet secure on the rider's head.